I was kayak fishing with friends recently on a sultry morning near Corpus Christi. It was one of those days where the flats were hot, still, and silent. 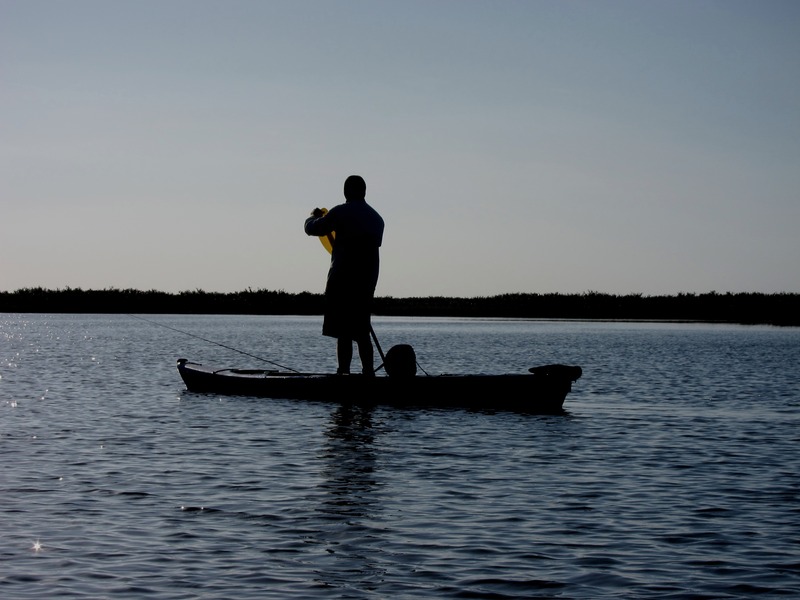 We had spent the better part of the day paddling and searching the shallows, with little to show. The lifeless flats and stifling temperatures had slowly whittled away our concentration. As lunchtime approached we were wiping our brows and quietly acknowledging our angling adventure had been reduced to nothing more than a steaming hot kayak trip with a lot of miles left to go. But then we had a stroke of luck. 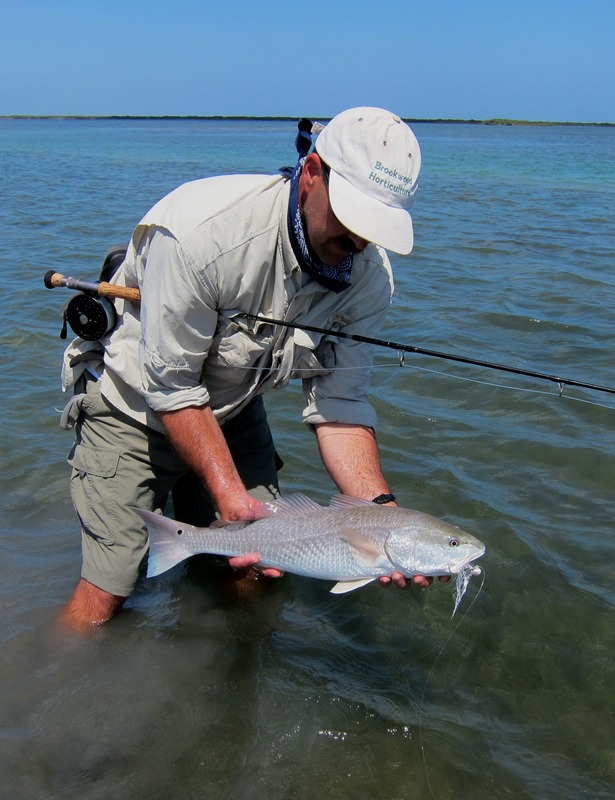 Our path crossed a big school of redfish, writhing and cruising in the shallows near a small secondary channel. “Finally” I thought, as I quietly slipped the anchor in. I eased out of the boat and stripped off some line. It was a perfect set up. The school was quartering slowly toward us, like a giant target. I made a nice clean cast, dropping the fly a few feet in front of the leading fish. But my hopes fizzled as I watched the entire school split and deliberately swim past my fly as though it were a fencepost in the middle of the trail. In disbelief I shot another cast and again the school split, uninterested. The fish slid silently past us but did not spook. Instead, they made a slow steady circle and came by a second time… and then a third. We kept casting but still we could not catch them. 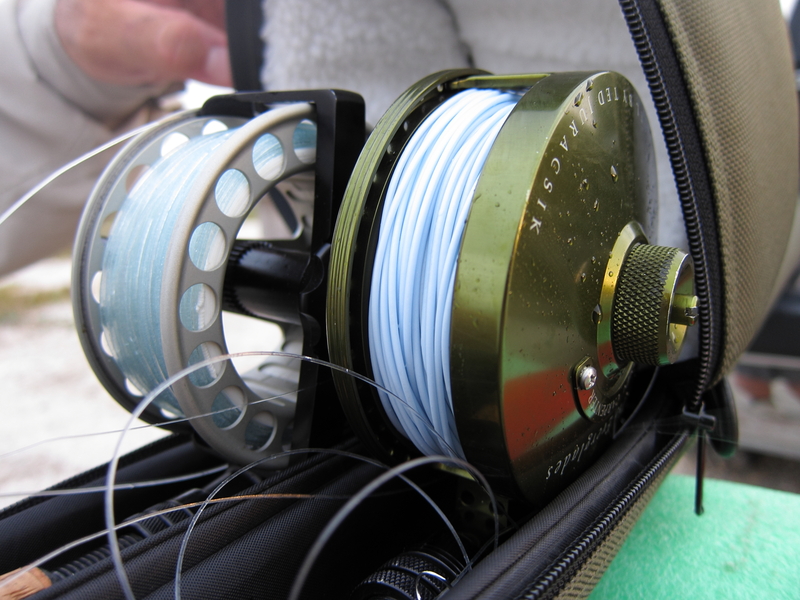 Over the next hour we cast nearly every fly we had at those goofy fish. Glaze-eyed and strong-willed, they just kept swimming in big circles like hypnotized salmon, barely flinching as flies rained down on them again and again. It was as though their dial was stuck on “swim.” I finally managed to tag one with a chrome baitfish pattern, but could not repeat it. Eventually we had enough. Exhausted and defeated, we shook our heads and bailed on the zombie school of redfish. It was one of those experiences that can rattle your confidence and make you reconsider how much you think you know about catching fish. 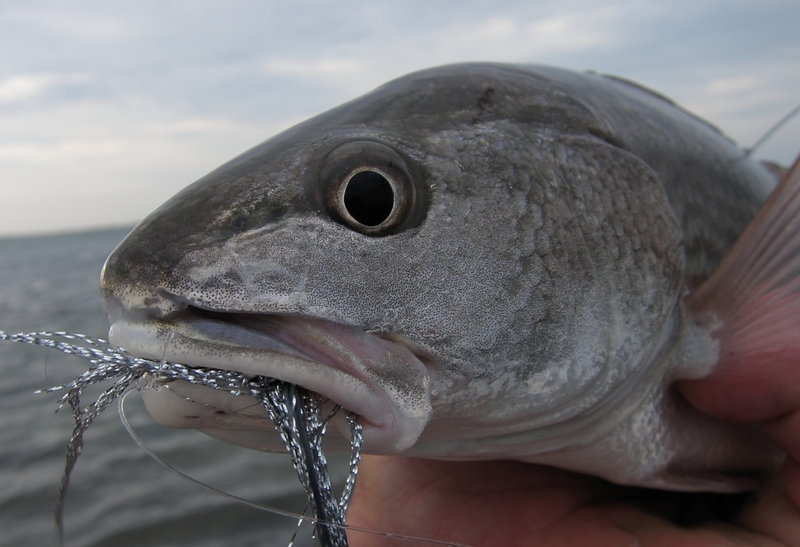 Why did those redfish behave that way? Why would a mob of predators pass up an easy meal, over and over again? Were they full? Sick? Perhaps the slack mid-day tides, or the tepid water, or the full moon shut them down. Or maybe it was none of those things. 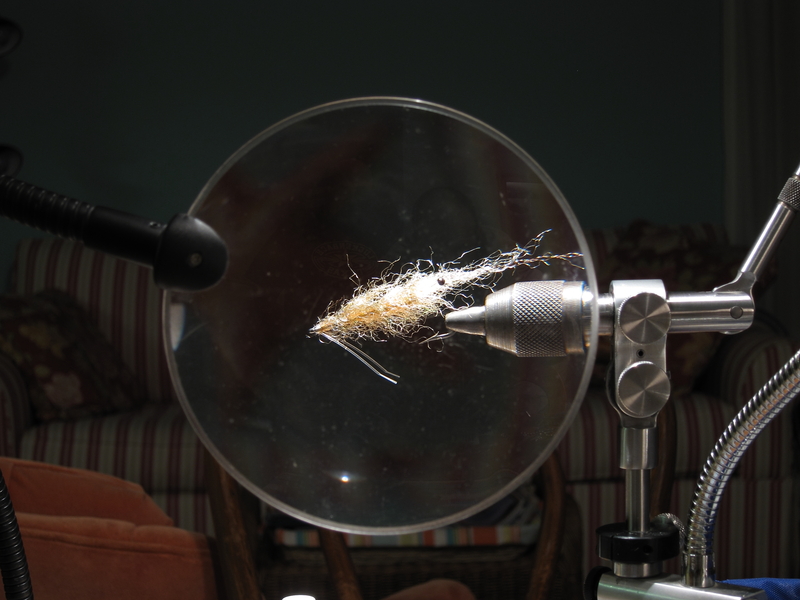 That evening we sat around a table full of fly tying materials and vises and tried to come up with the answer. The only thing we knew for sure was we had paddled a long way, found some fish, and couldn’t catch them. In retrospect, we probably needed a day like that to keep us honest but it was a tough pill to swallow. The following morning we headed out at daylight and paddled to an area near where we had seen the school of reds. We were joined by Corpus Christi angler Austin Orr. Austin is an expert distance caster and has remained unbeaten for many seasons in the biannual Fly Casting Contest at Roy’s Bait and Tackle. I keep telling Austin I’ll beat him, ”Next time.” So far it hasn’t happened. Austin spends much of his time fishing on foot, throwing shooting heads at pelagic species like kings and jacks from the jetties. If you have ever fly fished from the jetties you know how rough it can be. Waves, barnacles, knee-gouging rocks… Fly fishing from the jetties is a tough gig but Austin’s good at it. As we pushed slowly across the flats, there was an obvious lack of activity- no wind and no bait. It did not look very promising but the tide was starting to flood and that, at least, was in our favor. We pulled around the front of a large slough and paddled toward a wide bottleneck where a scattered group of islands met the main shoreline. It was really a nice spot, with a hard sandy bottom and just enough low grass to hold shrimp and crabs. 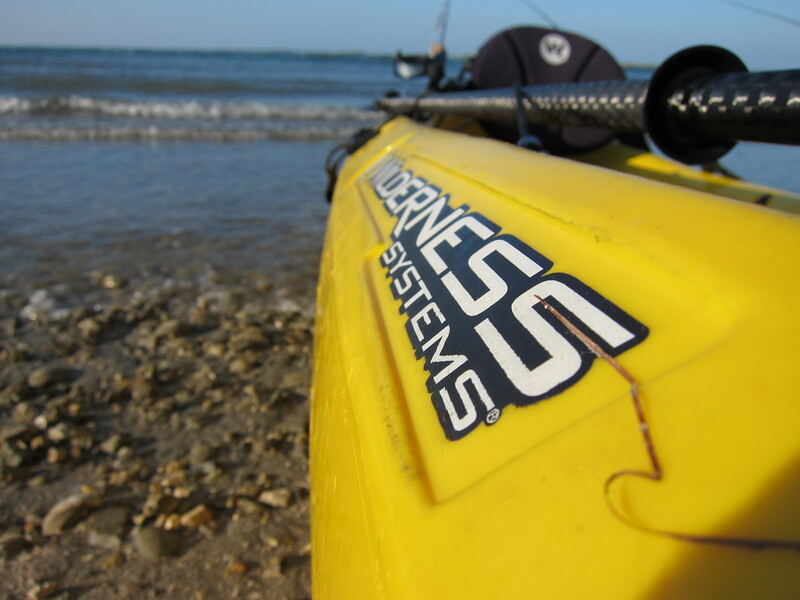 The water was only a few inches deep in places and I could hear my kayak hiss as it brushed over the sand and weeds. Austin stood up and poled his kayak over the shallow water to get a better vantage point and we all hoped things would start happening. Up ahead I noticed a few surface wrinkles radiating from the bank… then a few more. It was a good sign. We paddled a bit closer and suddenly four redfish came into view. They were about 75 yards away and had their backs completely out of the water. We anchored our boats and quietly waded closer. I fired a small brown shrimp pattern up ahead of the first fish. The red turned and exploded on the fly. At first I thought I had spooked him but when line started ripping through my fingers I knew the fish was on. A few minutes later, Austin made an effortless long cast and landed his fly right on the mark of a second fish grinding through the sand. The fish surged forward and with a “chuck” sound, inhaled the fly. Austin’s reel zinged. It was a great sound. I glanced up the shoreline and could see numerous tails and bodies starting to pop up in the placid water. Things were looking good. We had found the fish and this time they were hungry. As the cool currents surged through the bottleneck and around the tiny islands it made for a prime hunting ground, and we were right on it. 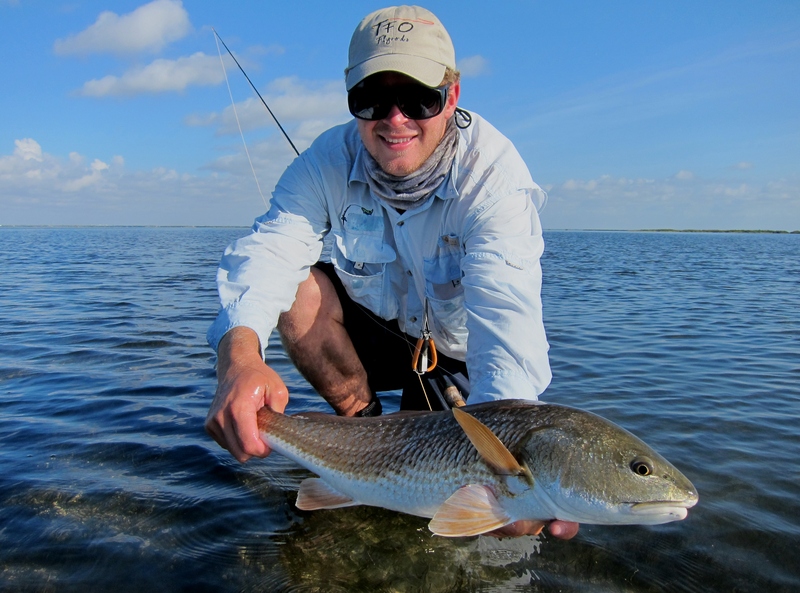 The action continued for several hours, with each of us catching redfish as they aggressively dug through the sand and mud. What a difference a day had made. But that’s the way it goes… and how it should be. We endure the tough days and they give us a better appreciation for the good ones. We learn what we can and marvel at the rest, always remembering how lucky we are to spend time with friends, doing what we enjoy, in a peaceful place.